An assisted living facility is a special place where seniors can comfortably reside while getting the health care they require. Because these communities are designed to be comfortable and peaceful, it’s important for facility operators to keep interior and exterior paint fresh. Drab, faded colors and peeling paint can make your building look uncared for which can turn off both current and future residents. A painting company hired to paint the interior and exterior of a new build living facility must have plenty of manpower, lifts, large capacity spray rigs and the experience to move quickly with a quality finish. Provide a warranty covering labor and materials at the time you receive your painting quote. Have a license issued by your state. Use the right painting equipment such as lifts and scaffolding to reach all heights safely during the painting project. Be current on safety certifications including Fall Protection & Aerial Life Operation. Have multi-million dollar general liability insurance coverages. Be able to provide a bond, if needed. Commercial painters understand that an assisted living facility is a community and home for your residents. This is why they prep and paint during the best hours for your staff and residents to minimize any disruptions. Whether you need them to paint on weekends, or evening shifts, commercial painters will do everything they can to accommodate your needs and schedule. For example, if there are other trades working at the same time, common in a new build environment, they will work around the dust, debris and other trades to keep the project moving forward and on schedule. Commercial painters are also quick, efficient and put special care into painting senior living communities to not only keep your facility comfortable but provide your residents with a beautiful home they can be proud of. 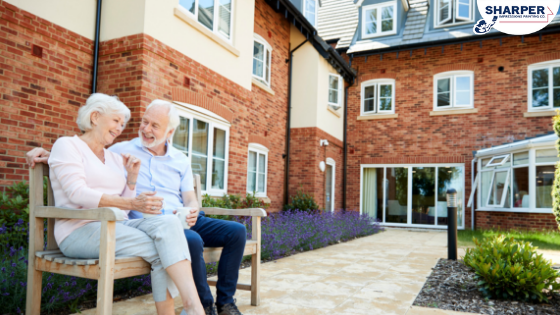 Many residents in senior living communities have compromised or sensitive respiratory systems. This is why professional painters will only use low-VOC paints to ensure that gases released from drying paint doesn’t harm your residents, staff, or painters. Low-VOC paints don’t contain volatile organic compounds which means they minimize “paint smell” and contribute to much better interior air quality. They will use drop cloths and other protective means to cover interior floors, furniture and decorative items. They will expertly maneuver around overhead lighting fixtures and chandeliers to ensure paint stays on the surfaces they are painting. They will give special care to cleaning up after themselves every day to minimize any disruptions to your residents and staff members. On new builds, they will ensure that they don’t interfere with other trades who may be working around them at the same time. Commercial painters are focused on providing assisted living facilities with quick, efficient and beautiful paint jobs that last. If you’re looking for interior or exterior commercial painting services to maintain or refresh your assisted living facility or senior living community, look no further than Sharper Impressions. Our painters have over 25 years of experience, capabilities, specialized training and the right equipment to finish your project on time and on budget. Your residents are going to love the way their home looks after a paint refresh! Get your free commercial painting quote today!